Toon Boom Harmony can receive images from any TWAIN device such as scanners and digital cameras. These images can either be loaded into your scene as bitmaps or converted into vector- based images that can be edited using Toon Boom Harmony. If your operating system does not automatically recognize your device after it has been connected, you must install the correct TWAIN drivers in order to access its contents. You can usually download the drivers from the device manufacturer’s website. From the top menu, select File > Acquire > From TWAIN. The Acquire from scanner window opens. In the Scan Drawings window, select your scanner or other supported TWAIN device from the Scanner menu. If none are available, check your device to ensure that it's properly connected to your computer. If your device still does not appear in the menu, you may have to shut down and restart the software. In the Layer section, decide if the scanned or imported image will be placed on a new layer or existing layer—see Import Images Dialog Box. Drawing Name: Name of the drawing to import. Hold Value: Type the number of frames that the drawing will be exposed. Scan and Advance: Lets you scan one drawing after another every time you click Scan. Flip Drawing: Mirrors the drawings horizontally and scans it this way. 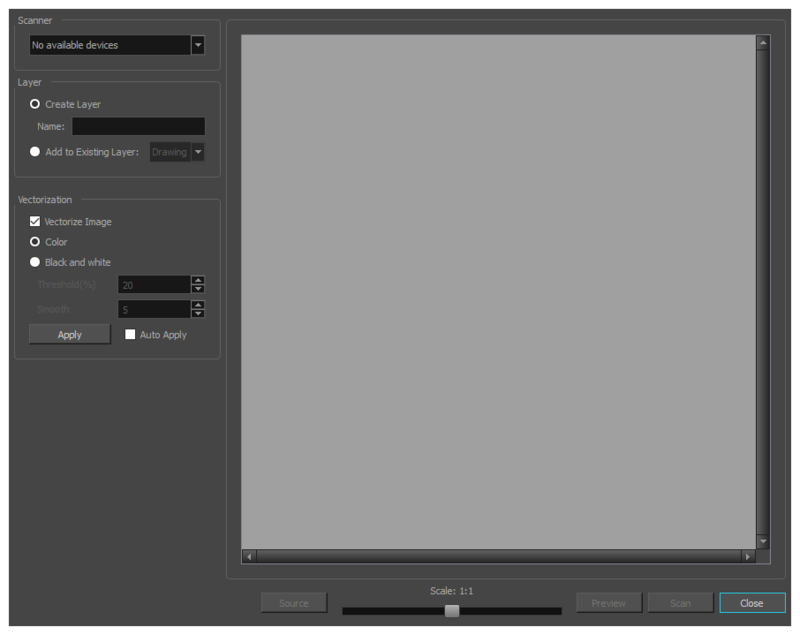 Adjust the Scale control and sliders in the Preview Image window until you are satisfied with the view. Click Scan to scan your drawing. If you are scanning panoramic drawings, in the Page Panning section, move the slider to the next letter to capture your next frame. 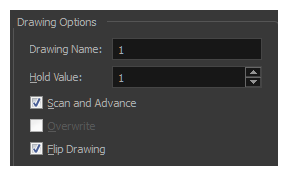 If you have more than one drawing, set the next drawing in place and click Scan again. Repeat until you have finished scanning all your drawings.